You'll find Swing Handles to Wire Handles. Choose from the categories below. American made and economical, these Solid Hardwood Market 'D' Handles have strong, glued finger joints. Sizes are approximate. Easy instructions for weaving your basket base using a 'D' Handle. 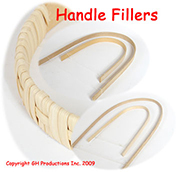 You'll love the way these handles look and feel in your baskets! Beautiful as well as useful, White Oak Swing Handles with Ears fit almost any basket from 5" up to 12". 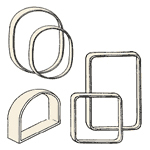 Add a little swing to your baskets with these Wire Handles. Grips are hardwood.